If you’ve been through a fire, then you may be in talks with the insurance company about repairs. However, there are hidden costs and other challenges that you should be aware of. In fact, fire damaged homes can be full of unwanted surprises, and you may just decide that it will be easier to sell the structure as it is and put your insurance proceeds towards another property. Smaller fires can still produce an incredible amount of smoke, and that smoke permeates everything throughout the home. While most burned materials will be replaced, items that weren’t burned will often be left in place, but these can still reek of the smoke. Long after the fire has been put out and everything cleaned up, you may still catch a whiff of the smoke in salvaged sheetrock and other fixtures. If you’re going to fix up the fire damage, then plan on coating the entire structure with special cleansers and blockers. You may also wind up replacing things like cabinets down the road if you find that you can still smell the smoke. Your walls can have structural damage even if the sheetrock outside seems to be fine. In fact, depending on where the fire started, the damage can be largely hidden behind other fixtures. The first step is to have the property assessed by a structural engineer, and then the repairs should be completed by a licensed contractor. Tearing out the wall structure and rebuilding it can take time, but it will help you avoid serious subsequent damage in the future. Fires produce a great deal of ash and soot, and the particles can drift everywhere. One of the greatest problems with ash is that it can lead to corrosion, etching, and discoloration long after the fire has been extinguished. This is why most companies want to start the fire recovery cleanup as soon as possible. Even items that were not directly touched by flames can be irreparably damaged by the ashes and will need to be replaced in order to fully restore the house. If the house was vacated immediately after the fire and several weeks have already gone by, then the damage is probably done. Most of the fixtures inside the home will need to be replaced, and this can substantially raise the overall cost of renovations. Wood, upholstery, glass, metal, plastics, and vinyl can all be impacted by the presence of ash and soot. In addition to the direct damage from fire, another type of indirect damage is melting building materials. Even though the fire may have been on an interior living room wall, the vinyl windows and door on the exterior walls can still melt and warp. This damage may not even be readily apparent, but you’ll realize it down the road when they won’t open and close properly. Additionally, the window seals may be compromised, so the fixtures will no longer be energy efficient. PVC pipes will likely need replacement, and you may even have problems with your copper pipes if the fire burned hot enough. This is because the soldering used with copper pipes is very soft, and it can easily be compromised by high temperatures. Even worse is the fact that the damage may not result in an actual leak for months or even years. This is why many reputable companies will want to check and replace the plumbing throughout the fire damaged area and in adjacent rooms. Depending on the time of year when the fire occurred, it’s quite likely that the HVAC was in operation while the fire was running. As smoke and ash are pulled into the ventilation system, they coat the ductwork. In addition to replacing the operational unit, you may also need to tear open walls and ceilings to have the ductwork replaced. Another problem that’s often overlooked is the need for mold remediation afterwards. 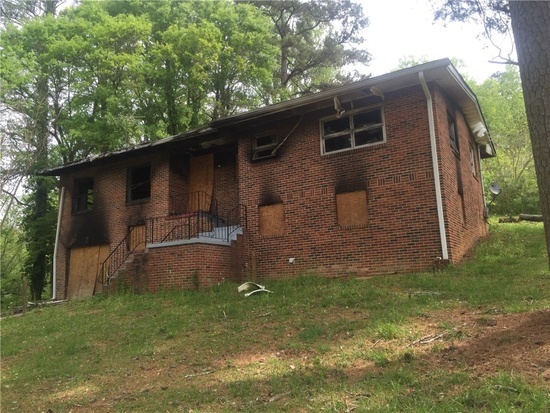 Even if a home cannot be saved from the blaze, the fire department will still soak it with water to contain the blaze and stop it from spreading to nearby properties. The water gets into the walls, down in the basement, and throughout the attic. Insulation is soaked, sheetrock is ruined, and wood fixtures will warp. The water must be removed completely as soon as possible, but this isn’t always possible depending on the extent of the damage. As with the ash, the sitting water can become its own dangerous problem by encouraging the growth and spread of mold. This issue may be more pronounced if you had a relatively small house fire that didn’t actually damage the exterior walls. You may think that the water is cleaned up because you don’t see any on the floor, but it can be trapped beneath cabinets and inside walls. In this case, you should plan on replacing insulation throughout the damaged area and adjoining rooms. If the fire department hit it with the hose, then it will need to bel dried out. Dehumidifers can be run to take care of the hidden area, but you may still have to replace some sheetrock and attached cabinets because it will be too difficult to dry up the water otherwise. Another challenge with the fire damage is the wiring. The wires in your home are run as solid lines with special junctions at points where lines connect and intersect. If the wires in one room are damaged, you’ll need to replace the entire line back to the nearest unharmed junction box, so that can mean opening up walls in rooms that weren’t directly touched by the fire. The result can be costly electrical replacements and repairs. If the issues with the lines aren’t inspected and addressed right away, then you’ll increase your risk of an electrical fire down the road. In addition to the power wiring, you’ll also want to check your thermostat and control wiring to ensure that you won’t have problems with them later. In a very severe fire, even the foundation can be damaged. In this case, it’s generally more cost-effective to just build an entirely new structure rather than trying to salvage the old one. This can delay your move-in date by several months as you coordinate contractors and wait for the different stages to be completed, but you’ll have the peace of mind that comes with knowing your home is safe and secure. When it comes to fire damaged homes, there are several things to consider. The cost for repairs can be extremely high, even if the fire was contained to a relatively small area of the home. In addition to having issues with fixtures and materials in the areas directly affected by the fire, you can also have serious damage to the adjacent rooms and anyplace where the ashes settled or the fire department had to spray water. Problems can continue to appear for months and even years if the repairs are not done properly during the initial renovation. The cost can continue to rise, and the timeframe for moving back in may be pushed back steadily. However, after a careful assessment of the damage and repair needs, you may decide that it will be less stressful and safer to sell the house as-is and apply your insurance proceeds towards a different property.